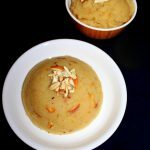 Suji ka halwa is a very popular dessert or sweet recipe usually made during small occasions with sooji. Take a pan, heat it. Add sooji/suji, dry roast it for about 10 minutes on low flame. Transfer the roasted sooji on a plate and rest it aside for further use. Into the same pan, add sugar and water, stir and cook until sugar is dissolved well . Rest this sugar syrup aside for later use. Take a wok, add ghee and heat it. Into it, add sliced almonds and cashewnuts. Saute them for few minutes on low flame. Into it, add the dry roasted sooji and roast again for few minutes until color of suji changes to slight brown. Add sugar syrup, add saffron strands soaked with milk, add green cardamom powder. Stir continuously so that lumps do not form while mixing. Keep mixing and cooking for few minutes in low flame until sooji thickens. Cook for few more minutes on low flame. Give a mix and suji ka halwa is ready to be served. Serve it in sweet bowls and its done!!! 1.Adding generous amount of ghee gives a very good flavor to the halwa. 2.Roasting sooji helps the halwa by not forming lumps while mixing the sooji with sugar syrup. 3.Always make the halwa on low flame and make sure to use only non stick cookware to make indian sweets or desserts.